We’ve been wanting a simple primer for attachment theory for a while, and while there are several really good books around, not everyone wants to read a whole book on the subject to get an idea of what it’s about. We also wanted to give our view of this topic, after ten years of working with couples, and increasingly finding attachment theory to be a useful model for understanding what goes on in the sometimes mysterious interactions between partners in an intimate relationship. So we’ve added a new page to the web site: An Adult Attachment Primer. Couples often fight about how they fight. In doing this, they’re not usually fighting about the actual issues in the relationship. They come to therapy speaking of the “communication” issues that they have. This is often a pointer to the fact that they’re “spinning their wheels” on secondary concerns, while below the surface the the primary attachment issues are playing out and are remaining unaddressed. These primary issues are often about how people handle stress and conflict in an intimate relationship. The Adult Attachment Primer doesn’t describe everything we do with couples. 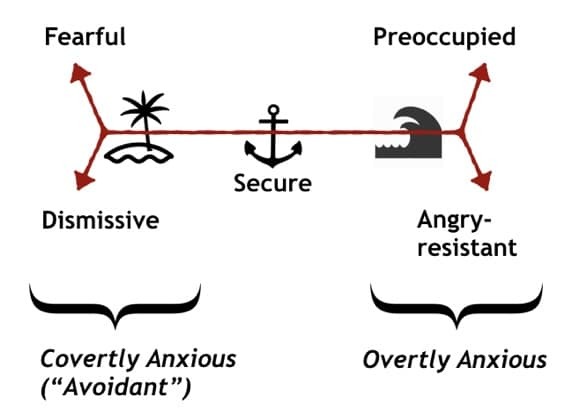 Attachment theory offers just one model, but it can be a very useful one, particularly when two people’s attachment styles are very different (and even when they are the same). For example, it can help to see how one person in a relationship might be driven to repair a disruption with the other, while the other person might be driven to withdraw from contact to reduce stress. The partners can start to see what the drivers are for themselves and for the other person. Click here for The Primer, which explains the diagram at the top of this post. If you’d like to understand how these issues may be playing out in your relationship, please give us a call.